I've only once had the fortune of gracing the great state of Kentucky and yet in that trip, I had the misfortune of visiting over a New Years weekend when I could find not one open coffeehouse. Alas, it was a mixture of poor technology and bad timing that left my sole Kentucky excursion to date a coffee-less one. Of course I hope to rectify this one day, especially with the growth of good coffee in the state. 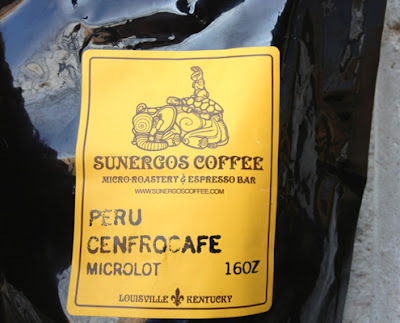 One coffeehouse/roaster that seems to be doing some spiffy things is Sunergos Coffee out of Louisville. Recently they sent me out a pound of their Peru Cenfrocafe Microlot to take for a spin, which I had the pleasure of doing via pourover, french press and siphon. The pourover relayed a medium bodied coffee ripe with nougat, honey nut cheerios, sweet cream, apple and Italian bread. A delicious brew reminiscent of dessert, full of chocolate and fruit notes. Of the french press, it also proved scrumptious, with notes of milk chocolate, elderberry, wheat, a little sage and a little ginger amidst a silky and smooth body. The siphon was the final hurrah, with more nougat, wheat, sauvignon blanc, raisin, cashew and a little shitake within a medium body. A sweet cup with a dry finish. Through and through, this Peruvian coffee boasted a splendid profile that would make any breakfast or after-dinner meal delightful. Give Sunergos a try if you're looking for a great cup of coffee.